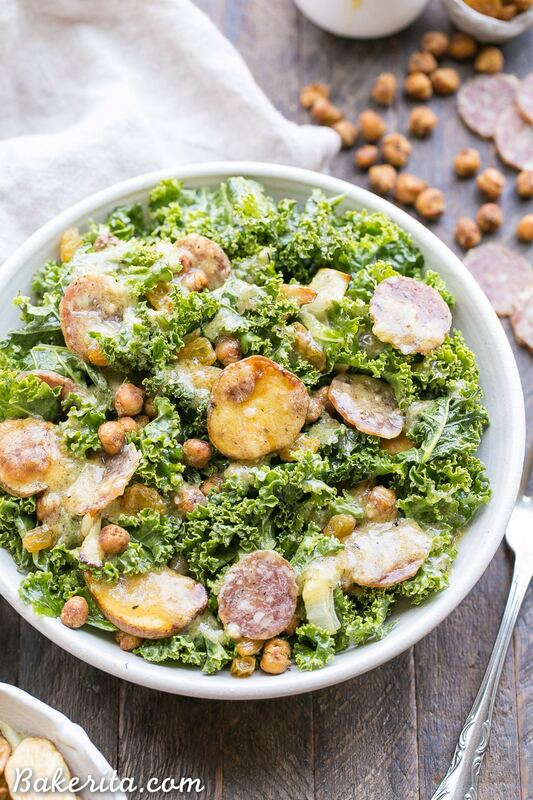 This Kale & Salami Salad with Roasted Garlic Vinaigrette is loaded with roasted fingerling potatoes, crispy toasted chickpeas, golden raisins, and caramelized onions! This filling salad makes the perfect lunch or dinner. It’s gluten free and dairy free, with a Paleo option. So, there’s this salad that I’m kind of obsessed with. It’s from Tender Greens, a California based restaurant chain that specializes in making the most delicious salads with high-quality ingredients. 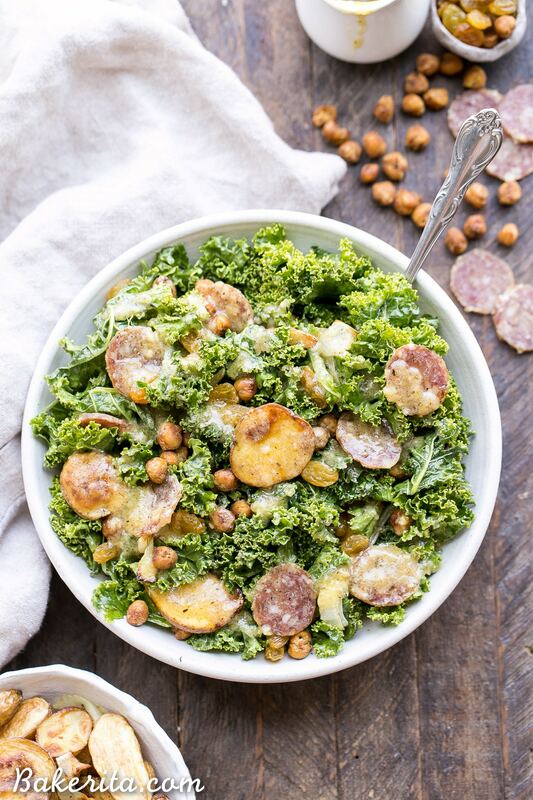 I’ve been going there for years, usually on lunch or dinner dates with my mom, and always ordering the same thing: the salami & kale salad with roasted garlic vinaigrette. Holy cow, it’s SO good, you guys. It’s the kind of meal I would crave when I was living in Seattle and couldn’t get one. 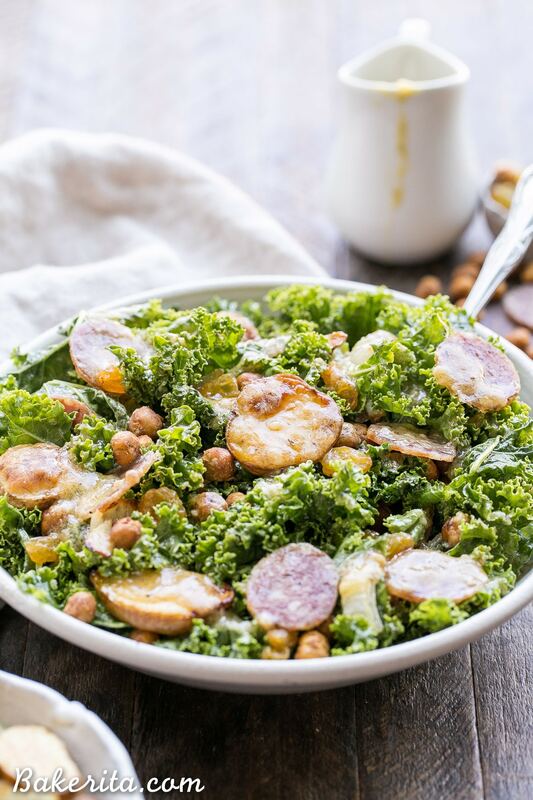 The salad has a kale base that’s super tender, and it’s loaded up with artisan salami, roasted fennel, golden raisins, roasted fingerling potatoes, crispy chickpeas, and parmesan, all tossed in the most drool-worthy roasted garlic vinaigrette. I’m a sucked for roasted garlic ANYTHING, and this vinaigrette could go on anything I eat and I’d be so happy. Since I moved back home to San Diego, I’ve been getting it on the regular. However, a few weeks ago, I got call from my mom. She was a little dismayed, telling me she went to Tender Greens only to see that our salad was GONE from the menu. Upon inquiry, the workers said it was going to be permanently disappearing. Oh, the horror. Soon after she told me that, I exclaimed to Jesse that I needed to recreate it as soon as possible. Sooo…the next night for dinner, guess what we had?!? Okay, I guess it’s not so hard to guess. You’re right. We had this salad. Well, my recreated version, which Jesse and I both concluded we liked even better than the original. High praise, indeed. So let’s talk about how to make this super hearty, filling salad. There’s a few steps, but they’re all SO worth it, and you can do some of them ahead of time so you can throw this together whenever your heart desires. Starting with the heavenly roasted garlic vinaigrette! I always like to have a big jar of roasted garlic on hand (and I recommend you do to, to add flavor to EVERYTHING) which makes this dressing super quick to whip up. It’s super simple: a bunch of roasted garlic, mashed up, and mixed with olive oil, apple cider vinegar, salt and pepper. I like to give my kale a little massage with the dressing to help tenderize it, too. The crispy chickpeas are lightly spiced and sauteed for 10-15 minutes until they’re golden brown, toasty, and crunchy. While they’re toasting, onions and fingerling potatoes are getting a nice roast in the oven. Once everything is roasted and ready, toss it all together and dig in. 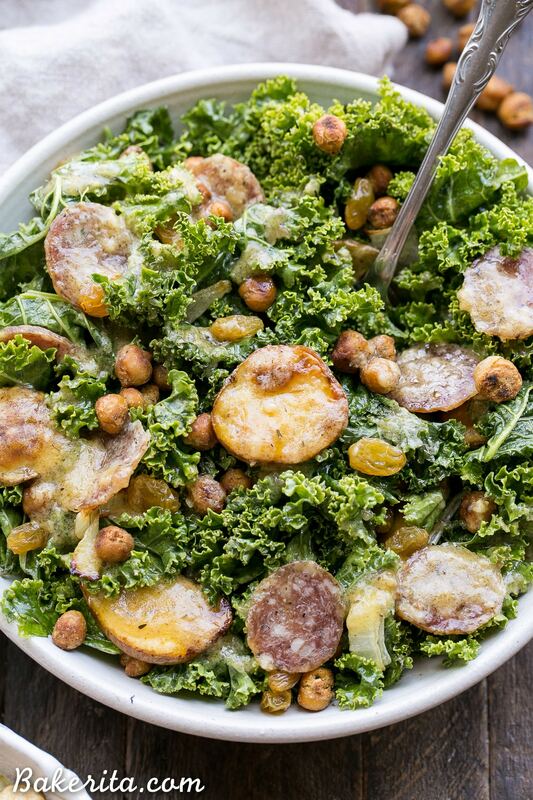 The salad is full of texture and flavor: crunch from the chickpeas, chew and sweetness from the golden raisins, salty from the salami, all tied together with the richness of the roasted garlic vinaigrette. If I do say so myself, it’s pretty irresistible. I hope you’ll give this one a try! Preheat the oven to 400ºF. Place the halved fingerling potatoes and onion slices on a lined baking sheet and drizzle with olive oil. Season with salt and pepper, as desired. Roast for 20 minutes, stirring once halfway through, until the potatoes are golden and the onions are translucent. While the potatoes and onions are roasting, sauté the chickpeas. Heat ghee or olive oil in a medium pan over medium heat and once it’s shimmering, add the chickpeas. Add the seasonings and toss to combine. Let the chickpeas toast for 10-15 minutes, or until golden brown and crunchy. Remove from heat and let cool. For the dressing, mash the roasted garlic in a small bowl or measuring cup, or place it in a small blender/food processor if you have one. Add the olive oil, apple cider vinegar, and salt and pepper and mix to combine. 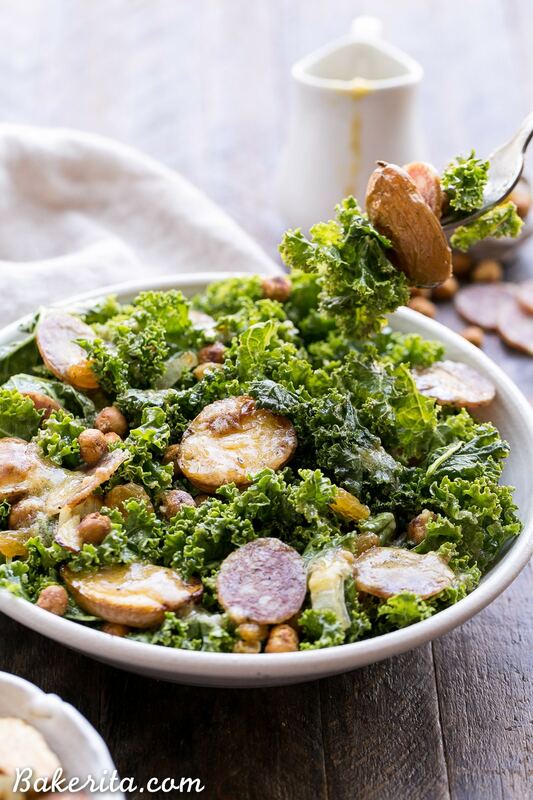 Place the kale in a salad bowl and drizzle with some of the dressing. Massage the dressing into the kale to fully coat all the leaves with the dressing. Toss in the roasted potatoes and onions, crispy chickpeas (it makes a lot - you may have extras to save or snack on if you don’t want to add them all), golden raisins, nutritional yeast if using, and salami. Add more dressing if desired. While I like this salad best served immediately, it keeps super well as leftovers too, although the chickpeas won’t be quite as crispy. Make this recipe paleo-friendly by using pecans (or your favorite nut) instead of the crispy chickpeas and ensuring that your salami is paleo-friendly. If you don't have roasted garlic on hand, roast it yourself! Place peeled garlic cloves (I like buying bags of them pre-peeled to save time) on aluminum foil and drizzle with a tablespoon or two of olive oil to coat. Wrap in foil and place in a pan. Bake for 45-60 minutes at 400ºF or until softened and golden brown. Store in a sealed jar in the refrigerator. This salad looks amazing, Rachel! I can see why it’s your favorite with so many good things going on in that bowl. I need to try that dressing asap! The dressing is out of this world! Thanks Kristine. Just made this for dinner! It was really good! I left out the salami and used all the chickpeas just to keep it vegetarian. The only question I have is about the dressing, the recipe says 1/4 tablespoon apple cider vinegar. I added about 1/4 cup instead and it turned out great! Thanks for the recipe! Wow Rachel! This is one amazing looking salad. I guess I’m kinda happy that Tender Greens discontinued it because that we might not be seeing your delicious version here. This beauty will definitely be making it onto my “must make” list. Thanks so much, Lynn! I’m glad I learned how to make it myself too :) hope you’ll give it a go! Everything about this gorgeous salad is just screaming my name, Rachel! 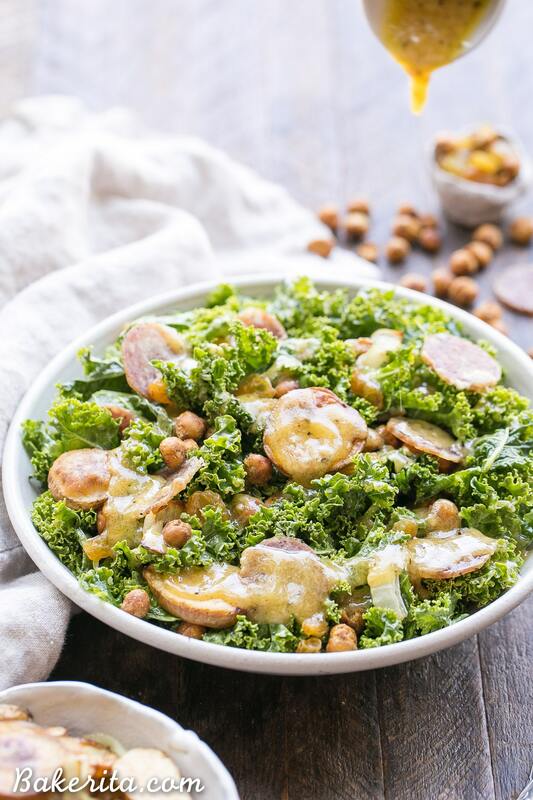 Loving all that beautiful kale + roasted fingerling potato goodness and that roasted garlic vinaigrette looks seriously SO flavorful! This is such a perfect salad :) The dressing sounds amazing!